To the South, four rows of pike formed a half circle about the end of the bridge. Along the road, ranks of horse were formed up, their pennants whipping in the wind. In the distance, catapults could be seen rolling slowly through the flattened fields. The dark mud dragged their heavy wheels down, but although it slowed them they drew ever closer. Protector Myrne had been slowly becoming more distressed across the last half hour and now his fear got the better of him and he ascended the tower. “We are undone!” he shouted. “The enemy are four times our number and the last message said relief was two days away! Do you not see? This is our end! Your end!” This last was a plea of sorts. Soldiers like Myrne died in battle, but surely General Lir would not have let matters reach this pass if he himself had no plan of escape? “It may be. It may indeed.” Serpent Lir turned and grinned at Myrne. He took a great delight in such moments. Where was the greatness in safe, easy victories? To march at the head of a thousand men instilled in him only a tired boredom. But this? It was life! It was the purest ecstasy. And although he had told Myrne not to disturb him, this would only make it better. “But we still have a chance!” said Lir, and drew the dice from his robe. Myrne had heard the stories of course. And now it came to it he would rather take his chances surrendering to the enemy. After all, at worst they would put him to death. Laughing, Lir rolled the dice. In an instant the ceiling was gone, replaced by a flickering vortex. They were plunged into darkness, then surrounded by blinding light and this cycle repeated endlessly as a great roaring sound shook the tower. Myrne curled up in the corner of the room, shaking. Something came to Lir’s call and Myrne felt an icy wind and heard wingbeats and heavy footfalls. All fell quiet and when at last the Protector opened his eyes the tower was quiet and Lir was gone. He was not taken, though. Once again the dice had fallen kindly that day and the battle was turned in their favour. 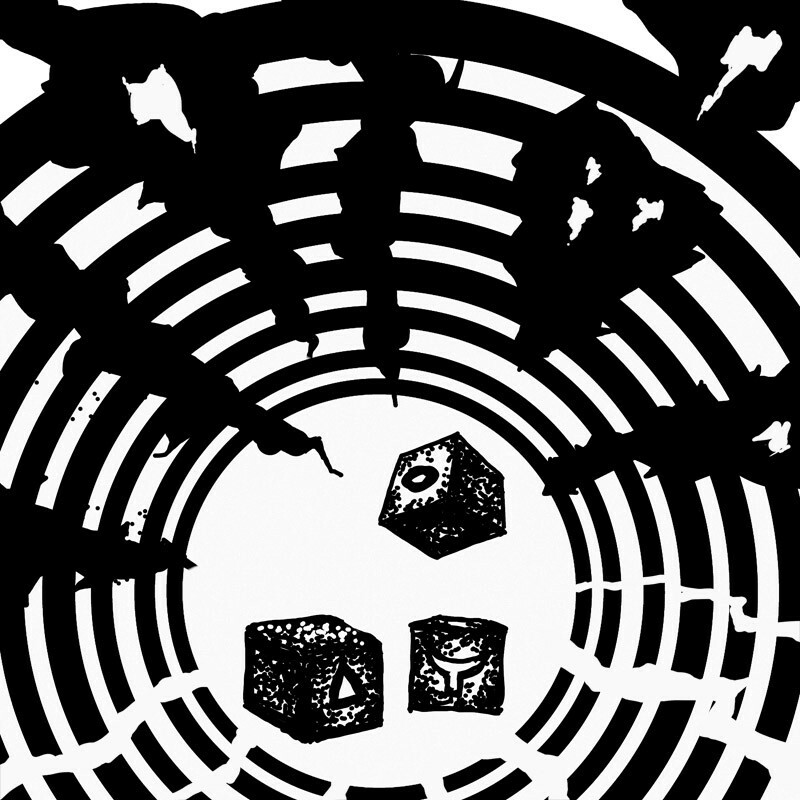 The Black Bone Dice are a holy (or perhaps unholy) artifact belonging to Ano, embodiment of destruction, said to be the most feared demigod ever to walk mortal lands. He does not keep them in his own possession, however. Instead, they are owned by whoever dares and Ano carries them only when they return temporarily to him. That the dice do return to Ano is inevitable. Each roll but one opens a great vortex to a distant point on the stairway from which aid or disaster may come. The one roll which does not will instead open a void pool into which the wielder of the dice is drawn. Beneath it waits Ano and they are utterly destroyed. As oblivion takes them, Ano catches the falling dice and will in due course gift them to another. This may happen directly, but more often he leaves them to be found in some suitable place. The Black Bone Dice date from the mythic epoch and not only is their origin long forgotten (Ano did not make them), but even the meanings of the symbols on their faces are lost. Nor is the secret of their power comprehensible, even to the most accomplished of alchemists or sorcerors. No mortal can hope to influence the roll of the dice. It is possible, however, that with the right secrets the vortex could be closed in time to prevent some unwanted outcome. Equally, there are ways in which whatever emerged from it might be dealt with. The only exception is the void pool. If chance dictates that Ano claims his price, only a greater power than he can prevent this. There are, however, ways in which it might be delayed. For example, the dice wielder could be transported very far away by other means. Such a feat would greatly anger Ano and the consequences would doubtless be terrible for all involved.